There is a sacred medicine for which these times are pleading and I want to know how it flows through you. In times of cultural transition from one paradigm to another, the world requires people who are willing to be able to propose innovative solutions that might challenge the status quo. In times of transformation, it is the skills of the healer that need to take center stage. When our collective well-being is fettered by a global spiritual crisis, everyone suffers. We need a solid and shared foundation for a miraculous recovery, the possibility of wonder, unconventional remedies and creative revival in our medicine. It is time for us to become the revolutionary global healers that we have been waiting for, to embrace effective practices without apology or religious preference. 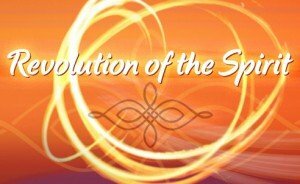 Revolution of the Spirit is a vibrant call to action for all spiritual seekers searching for a guide to create sacred space in their lives and a priceless resource for practitioners who want to dive into the mystic while maintaining their professionalism. Based in her own healing adventure with severe clinical depression and years of experience as a holistic medical practitioner, Gerri Ravyn Stanfield has created a breakthrough handbook that gracefully leads readers away from what makes them sick and towards nine ingredients to a more sacred life. While exposing some of the history behind the divorce of spirituality and wellness in both the Eastern and Western world, Stanfield takes readers on an exploration of nine ingredients to a spiritual medicine. Her Sacred Exploration exercises, Spiritual Inventory opportunities and Revolutionary Healer Dares offer a personalized challenge to release stuck and stagnant patterns and embrace these nine practices as medicinal, timeless and relevant. Revolution of the Spirit features interviews with brilliant authors, teachers, activists and practitioners that will stimulate an inspirational and timely conversation about the expansion of our collective health to include body, mind and spirit. Revolution of the Spirit is a peaceful takeover of the contemporary health care system on behalf of the sacred and will instigate readers toward an innovative and bold vision of wholeness. It offers a dare to people in all stages of their healing journey to leave learned hopelessness behind and become spirited changers of our modern lives.